The gasket system used by Rolex to seal their sapphire crystal (the “glass” that protects the dial and hands) to the watch’s case, is one of the best in the industry. I have yet to encounter a better engineered, more reliable, or impermeable system than the one they employ on their Oyster cases. In an average watch, the crystal is held in place with a simple, nylon ring. This ring, which we call a gasket, is typically left exposed to the elements, including direct exposure to UV rays, and serves up a straight passage for moisture to enter the watch should it ever fail. In the case of a Rolex Oyster, this gasket features a small hook-like ridge on its upper edge that fits securely into a channel cut in the perimeter of a Rolex sapphire crystal. Depending on the particular model of Rolex, this gasket may feature other small ridges or undulations, as well, all in the name of increased reliability in thwarting the ease with which liquid can penetrate the seal. The ridge on the gasket that holds the crystal in place effectively doubles the the distance a liquid or gas must penetrate to enter the watch via the seal at the crystal and also serves to increase the width of the gasket’s frontline defense. Once the gasket and crystal are fitted together on the case, the gasket is fastened tightly to the case by a metal ring in such a way that also doubles the distance a liquid or gas must travel to penetrate the watch via the gasket’s outer edge. Another benefit of this system is that, once sealed, the gasket is protected from the elements by the case, crystal, and metal ring or bezel. Furthermore, because the gasket is under pressure on all sides, the gasket cannot become dislodged following a strong impact or change in pressure, as it can in a more traditional configuration where the upper edge of the gasket is exposed. In light of these differences, this gasket configuration requires a different approach to installation compared to the majority of other watches on the market, which use the simpler nylon ring gasket. In most watches the gasket is typically installed into the case first and a case press is then used to press the crystal into place. However, in the case of a Rolex (or Tudor), the gasket must be installed into the groove in the crystal first and the crystal and gasket must be installed on the case together before a casing press is used. Although it quickly becomes second nature once you’ve done it a few times, installing the gasket on a crystal before installing it on the case can be cumbersome. The following short video clip demonstrates a simplified approach I began using several years ago, whereby the crystal is fit into the gasket while on the case, and is the method I’ve found to be most expedient and failsafe. This is just one example and certainly not the only approach. Some of our readers are likely already familiar with it, but for those who aren’t it’s a timesaver I felt worth sharing. Quick Fit of a Sapphire Crystal on Vimeo. If you have a different approach or other timesaver to share, let us know in the comments. Here’s another interesting page out of the annals of horological history in North America. 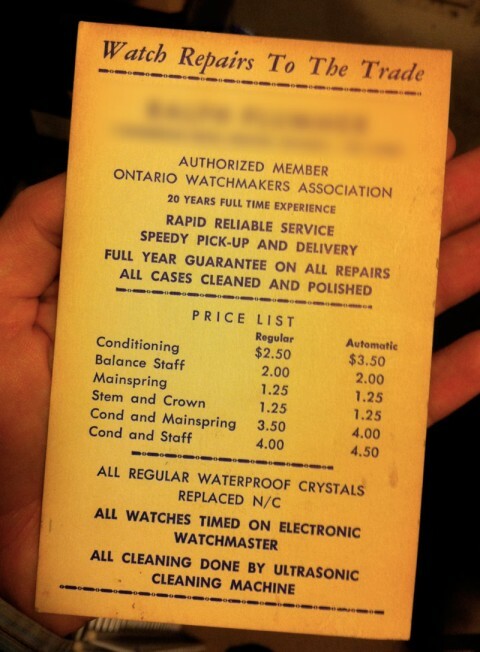 The following is a price list for “Watch Repairs To The Trade” that I came across not too long ago, in a box of old watch movements and watch literature from the 1950s, at an estate sale. While I can’t say with any degree of certainty whether “Conditioning” is the equivalent of a modern day servicing of a mechanical timepiece, I would be hard pressed to believe one could make a living performing a proper cleaning, complete inspection, reassembly, and final timing adjustment at that price point – even with inflation factored in. According to the inflation calculator at InflationData.com the trade rate for a mainspring in 2013 would be just over $12, while in actuality it’s more than double that (sometimes 5 to 8 times that) for a typical, Swiss mainspring today. Depending on the make and quality, the material cost of a new balance staff or stem and crown seem a little more in keeping with inflation for low end watches. 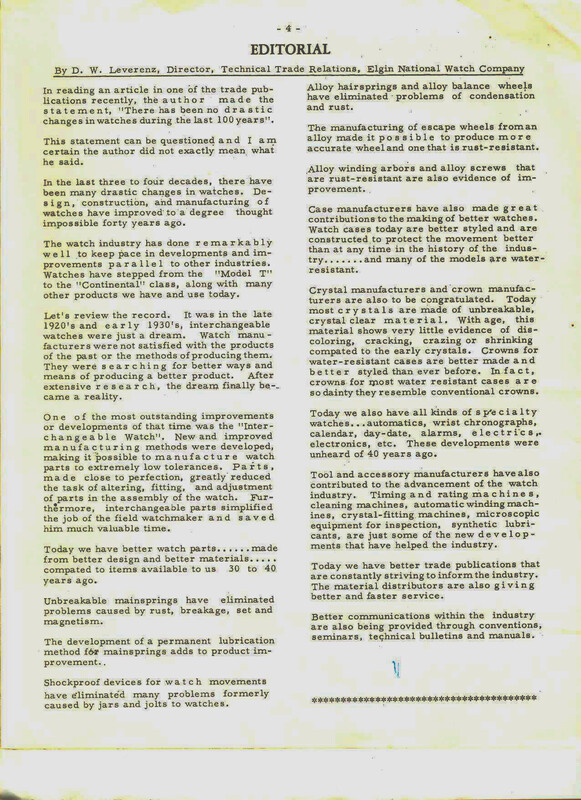 I recently was reading in the September 1969 edition of the AWI NEWS Bulletin when I read the following editorial from D.W. Lawrence of the Elgin National Watch Company. 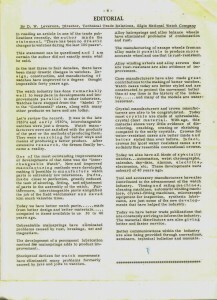 He spells out many of the improvements which were implemented by the watch industry from the 1920s through 1969. It’s a fun read. Click on the image for a larger version. When you get done reading please comment on what you think have been some of the great technological improvements to watches since 1969. I know that after I danced Gangnem Style in the last video you thought this was going to be the “Harlem Shake” but it isn’t. Endshake is the amount of play that an arbor has along its axis between the two bearing surfaces. On the 3130 Rolex specifies an endshake of 0.01mm to 0.03mm for the barrel arbor between the two bearing surfaces (one in the mainplate and the other in the barrel bridge.) A watchmaker needs to be able to judge this play without any measuring tools. He usually does this as much by feel as he does by visual confirmation. It has been quite some time since I had any feedback on my endshake adjustments so I set up a vertical micrometer dial gauge and measured the endshake of this barrel arbor without making any adjustments. Now its your turn. Below is a video of me testing the endshake of the barrel arbor in a Rolex 3130. How much endshake do you think this barrel arbor has? Leave your guess in the comments. Adjustments to endshake in modern watches are made using a jeweling tool, like the Horia, Seitz, or Favorite. Sorry, for the double post. For those who receive my blog posts in email and couldn’t see the embedded video here is a link to the video. You’ll want to watch it, its quite entertaining. So here is something that is just lots of fun! Pass it along and feel free to let the world know what it would be like If NFL Players Did Your Job. I trust you’ve had an enjoyable and festive season with your family and loved ones; now let’s start an exciting new year. My preceding two messages concerned proper business planning, methods of enjoying your practice, the state of the industry in general, and to a certain degree, spare parts. It would be quite safe to say that, without access to the required spare parts, practicing after-sales-service is a futile task. It is important to note that some of the world’s most successful watch brands have pathways in place for independent watchmakers to obtain spare parts, pending on training and tooling, among other criteria. More information on this model is available. This month’s message however, is geared specifically to those who are watchmakers, certified or not, working for companies of various types and sizes. With the increased production of Swiss mechanical watches since the early 1990s, we find ourselves with an abundance of watches that require service and this will be so for some time to come. Unlike quartz watches, which were easy to repair and quite often easier to simply replace, mechanical movements, mostly automatic winding in nature, require complete service to exacting standards. Having said this, you may come across workshop managers who are not understanding of these specific requirements. Their message quite often is that of pushing work out as quickly as possible, even if the mechanism is not repaired to the standards you learned while in the educational stage of your career. Some of your manager’s goals may be to lower your standard of workmanship to satisfy lower market prices, to increase productivity, or to simply perform substandard workmanship because that’s the only standard they’ve known. You are now faced with a dilemma. Do you lower your standards because this employer affords you an employment, perhaps health care insurance and paid holidays, etc.? It’s a tough situation to be in, especially if you have dependents. Don’t feel singled out; there are many who have traveled down this path before you. They also had to make this difficult decision whether to lower their standards to keep their employment. After all, work seems to be plenty and customers can’t really tell what was done inside the watch as long as the case and bracelet are polished and refinished. What can be the consequences of such a practice? One of the main ones is that your employer, seeing that you have agreed to lower your standards, will be tempted to press you even more to take shortcuts until the product is truly abysmal in quality. In the eyes of your employer, and to a certain extent, the client, you will be seen as the person to blame for poor quality work and therefore, a higher comeback rate. What happens now? You have traded your standards, your reputation and self-respect for someone who has little regard for this profession. How long will it be before you look for other employers (or customers) who truly admire and understand the art and science of watch repair? How long before you lose the precious art and skills you have painstakingly acquired? If you are forced to practice shoddy workmanship for whatever reason, feel free to document these events and contact the Ethics Committee at the following email address: ethics@awci.com. You may also contact me directly. This practice will be documented and investigated by the Ethics Committee and your matter will be dealt with in the utmost of confidence. I end this month’s message with the cartoon below which our Vice President, Wesley Grau, shared with me. This was given to him by one of his former watchmaking instructors. I find it summarizes the state of the watch repair industry. Notice the publication date—1956. Not much has changed since then. As always, keep your skills honed, your standards very high, your attitude professional, your tools and equipment in great condition and your workshops clean and organized; you never know who may come by to pay you a visit. At the tip of every balance wheel pivot sits a little flat ruby jewel called a cap jewel. It’s role is integral in the capped system for reducing friction on balance pivots. When the watch is dial up or dial down the rounded tip of the balance wheel rests on the cap jewel, instead of the shoulder resting on the flat of the hole jewel (as it would with the other pivots.) This is covered with more detail in the post on Shock Resistance and in the post on cap jewels. The point of this post is to stress the importance of examining cap jewels when servicing a watch. 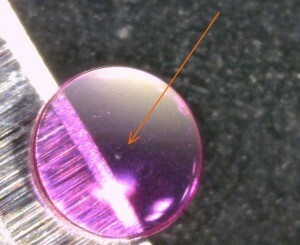 This little cap jewel has a small imperfection (at the tip of the arrow in the photo). It may seem like a little thing, just a tiny little dimple, but that little dimple increases the amount of friction significantly. I missed this imperfection during disasembly and when I put the watch together the timing results were quite ugly! In the world of watchmaking . . . it is the small things that make all the difference. Be sure to carefully examine every component for wear. Little things affect timing, future wear, and your reputation. Here is another great video from Gary Biscelli and the folks at the Lititz Watch Technicum.